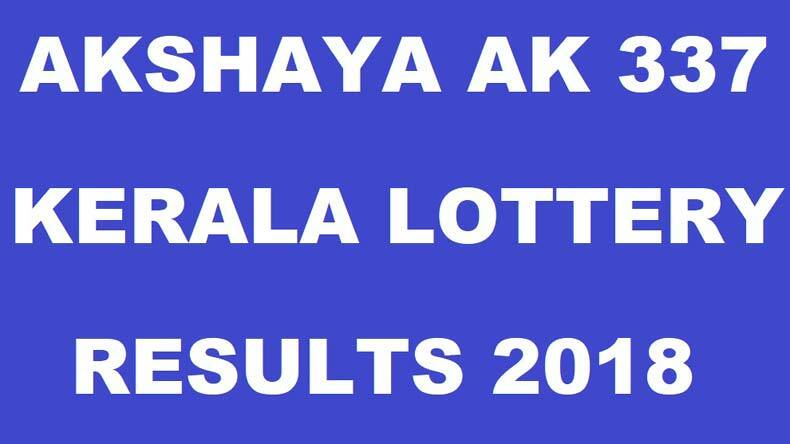 The lottery department of Kerala government on Wednesday released the Akshaya AK 337 lottery results. People who have purchased the Akshaya AK 337 lottery ticket can check their lottery results announced by the state government. To avoid confusion people are advised to recheck their live results with official results announced by the state government. The Akshaya lottery prize money details are as follows 1st prize Rs. 65,00,000/-, 2nd prize of Akshaya AK 319 lottery is Rs. 2,00,000/, third prize Rs. 10,000/-, fourth prize 5,000/-, with the consolation prize of Rs. 10,000. The lottery department of Kerala government on Wednesday released the Akshaya AK 337 lottery results. Only because of transparency, lotteries in Kerala are very popular among people. People who have purchased the Akshaya AK 337 lottery ticket can check their lottery results announced by the state government. The results were declared at 3:30 PM publicly. Remember there may be some chances of mistakes in winning numbers but chances are very less. So, the people are advised to recheck with official results. A lottery is a form of legalized government gambling that involves the drawing of numbers for a prize. Lotteries are outlawed by some governments, while others endorse it to the extent of organizing a national or state lottery. It is common to find some degree of regulation of lottery by the government. The Akshaya lottery Prize money details are as follows 1st Prize Rs. 65,00,000/-, 2nd Prize of Akshaya AK 319 Lottery is Rs. 2,00,000/, Third prize Rs. 10,000/-, fourth prize 5,000/-, with the consolation prize of Rs. 10,000. However, the prize winners of Akshaya AK 337 are advised to verify the winning numbers with the results published in the Kerala Government Gazette and surrender the winning tickets within 30 days.